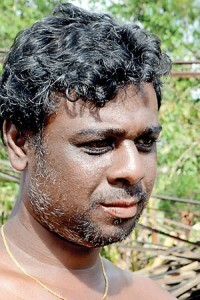 In the early days after the devastating fire at the Salawa ammunition dump, G Ananda Nimal was an angry man. When soldiers berated a photojournalist for shooting pictures of the ravaged camp through a shattered wall in his brother’s house, he launched into a tirade. “Who do they think they are!” he burst out, defiantly. “We have nothing left to lose. You take your pictures. We will take care of the rest.” He even smiled and shook hands as we parted ways. Two weeks later, the fire inside 51-year-old Ananda has died. 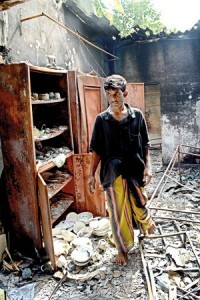 Much of his leased house and shop in Pathurugoda, Pahala Kosgama, is burnt to a cinder. The Army has cleared out bombs and shrapnel. But the floor remains covered in ashes, debris, glass and warped metal over which he walks barefoot. Like many others in Salawa who lost their livelihoods in the June 5 disaster, Ananda feels embittered. He had risen slowly and steadily in the world of small business, selling groceries and other merchandise. And he had recently saved up enough to make a down payment on a vehicle. This cherished “Dimo batta” is all he has left. Uncertainty plagues him. He waits, and waits, for the substantial Government assistance he needs to recover. For now, however, Ananda is marooned in a grey area which leaves him ineligible for a three-month allowance the State is granting the worst affected. His home was devastated. But since he was a tenant, it is the property owner who will qualify for payment. Ananda visits the Seethawaka Divisional Secretariat all the time. “I can build a house with the sheaf of letters and forms I have submitted,” he said. At night, he sleeps in a ubiquitous blue tent on a donated bed and pillow (tents have sprung up in many gardens, along with portable toilets). His sons and wife are in a relative’s home. The Salawa calamity has spawned a slew of daunting challenges that could take months, if not years, to resolve. Local authorities are struggling to keep up with a volley of complaints and public demands for reparation. Officials from the Government’s Valuation Department continue to assess the damage; there is still more ground to cover. Police teams visit affected homes everyday to keep tabs on reconstruction. Dilhani Anoja’s husband runs a small clothes boutique in Kosgama. It isn’t even earning enough to offset the monthly lease or pay an assistant. “Our customers were affected by the disaster and don’t have money to spend on clothes,” the 35-year-old mother-of-three said. Many residents had taken out loans to build homes and businesses. While their investments have gone up in smoke, they are left nursing the monthly installments. 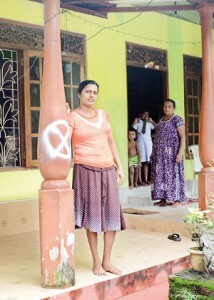 “I am so fed up,” said Rajatha Udayangani, a 42-year-old inhabitant of Ranavirugama. “I got a loan of Rs. 2 million from the Bank of Ceylon. I also owe money to Pan Asia Bank.” She had completed renovations on her house only a few months ago. There are fears that the Government will do a “patch job” of reconstruction. “We don’t want them to just put up roofs if our walls are cracked or the frames are shaken,” said one resident. For this reason, some view the reconstruction effort–which is currently restricted to restoring roofs and providing electricity and water–with some trepidation. They want compensation for losses. Meanwhile, there is dissatisfaction about the criteria applied to distribute the Rs. 50,000 the State has promised in the first three months. So far, the money has been disbursed to owners whose homes have formally been designated “not suitable for living”. This has bred resentment among other inhabitants who, despite having been badly hit, were able to shift back once their roofs were fixed. On Friday, an argument erupted among some residents of Ranavirugama on the outskirts of Kosgama. A group lashed out at a village representative, accusing her of having cheated them out of the payment. In the middle of this roaring fight, Surekha’s neighbour telephoned Minister Premajayantha who immediately promised them the payment. Even during a meeting he chaired that morning at the Seethawaka Divisional Secretariat, the non-allocation of allowances to larger categories of people emerged as the main grouse. The Minister was heard ordering officials to disburse the money to everyone hit by the disaster. But verbal, spur-of-the-moment orders like these are further complicating matters for ground level administrators. If not already done, the Government must issue clear, written instructions and stick to them. There must also be adequate recognition of the varying degrees of damage inflicted upon homes and businesses. Formulae must expeditiously be devised to calculate suitable compensation. The trickiest will be to match expectations with reality. But having subjected thousands of people to the worst manmade disaster since the war ended in 2009, the State can hardly wash its hands off the resultant mess. 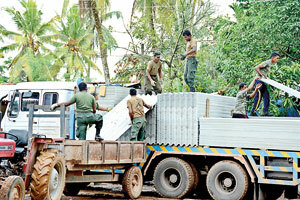 The disaster areas have been demarcated into six subdivisions–Ranavirugama, Salawa I, Boralugoda, Anandagama, Maturugama and Salawa II–each under the purview of a senior military officer. Hundreds of troops have been moved in for reconstruction. Roofs are getting top priority, followed by water and electricity. The Kosgama Government Hospital took a serious hit. Shortly afterwards, a provincial minister said it would be razed to the ground and a new building erected, said Dr. D.S.K. Liyanage, the District Medical Officer. But a week later, the Navy deployed one thousand men in two batches. Within 48 hours, the hospital rose from its ashes looking better than ever. It still smells of fresh paint. 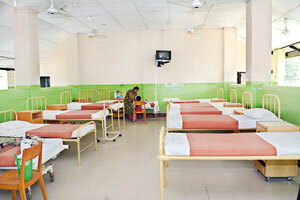 It has a new roof and ceiling, repaired floors and walls, modern waiting chairs, clean sheets and beds. The Navy did an amazing job, Dr Liyanage said. The outpatient department was restored by the Army. The immediate objective is to keep out the elements and to make the houses habitable again by mending shattered roofs. A large number of homes were seen with new roofs. 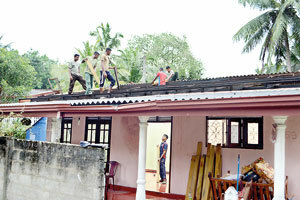 More than 350 Army personnel have been deployed at Ranavirugama alone, tasked with repairing 108 houses. Roofs on 59 houses were completed by Friday. The rebuilding effort is not without challenges. One of the main constraints is securing a regular supply of building material, particularly roofing sheets. Production has not kept up with demand, causing some delays. There is, for instance, a shortage of electrical wiring. The military is also careful to observe procurement guidelines to the letter, in order to avoid future complications. The rains started this week. Intermittent downpours have rendered roofs and exposed beams slippery. Care is being taken to minimise injuries among soldiers. More showers could add to delays.